As part of their increasingly experimental limited release range – not to mention one that doubled up as their GABS festival entry – the brewers at Stockade have released Fallen Angel, a chilli mocha pale stout. If that sounds a tad confusing, it sort of is. It’s probably best to start off by addressing the obvious: can a stout be pale? Must it not be Guinness black? Well, rules and style guides are bound to be broken, as this one has been plenty of times in the past by brewers who take a "stout is stout" as opposed to "stout as stout" attitude; what's more, the term stout was originally used in England to describe any beer that was a stronger version of a beer, so "stout porter", "stout pale" and so on. However, in this case, it's an attempt to do a reverse black IPA and create a beer that is pale in colour but has the character of a darker beer. On the nose it gives off some ominous characters that suggest chilli and capsicum, but once you get it in your mouth it’s all about the coffee. An upfront jolt gives way to the coffee and chocolate mocha characters which seem to become smoother and fuller with every mouthful. The stated bitterness of 80 IBUs [in other words, far higher than most IPAs] doesn’t necessarily carry through to the back of your palate, and all the better for it. 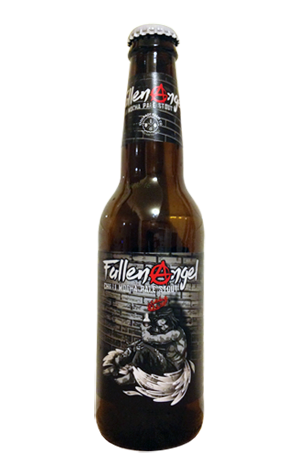 Despite being loaded up with a single hop – Magnum – it doesn’t come across as hoppy enough to be a typical pale ale, yet it no way dark enough to be seen as a typical stout, hence its designation as a Fallen Angel: punished for playing outside the rules and living somewhere in limbo.